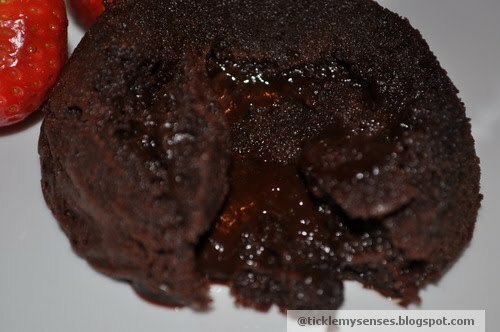 Tickle My Senses: Sinful and Decadent- Gourmet Molten Chocolate Mini Cakes- Cause You are worth it !! Sinful and Decadent- Gourmet Molten Chocolate Mini Cakes- Cause You are worth it !! The outer soft chocolate layer gives way to a molten, velvety, sinful chocolate center that will take your breath away!! Made as individual portions in ramekins. Can be served hot straight out of the oven with a dollop of ice-cream or served chilled the next day. Personally I prefer it cold. This recipe is very versatile, depending on how runny you want the centers. You can accordingly alter the baking time... I like it with a molten oozing center -- so i baked it for around 9 minutes, such that the top is cooked through, but the center is molten liquid. If you don't like the liquid-center just cook it for a little longer, and you will have an incredibly moist chocolate cake. So, either way, its a win win situation!! 1. Melt chocolate on low flame in a bain-marie (double boiler). When melted, take of flame. 2. Stir in the diced butter, until it melts. 6. Cook for about 9-10 minutes. 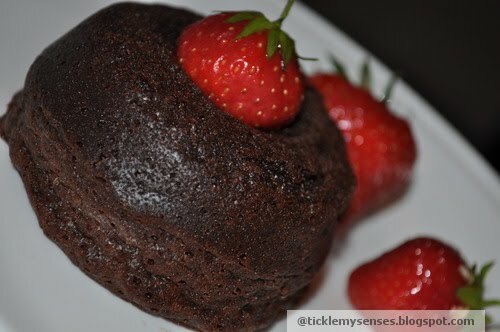 Tips: You can prepare your chocolate lave cake recipe ahead of time, and then bake 10 minutes before serving. In terms of buttering the ramekins: butter the bottoms first, and then butter the sides, wiping from the bottom up to the top. It helps the chocolate to rise even more. hehe ulka..... just this once dont think about ur waistline......im sure you wont regret it! !....u r worth it !! 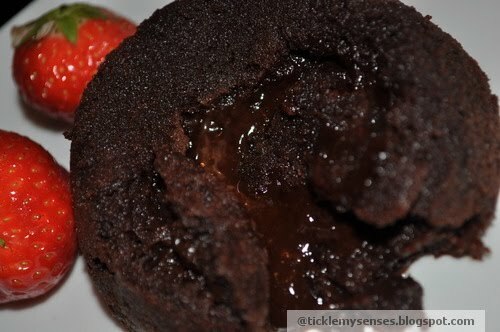 i love anything chocolate and your molten cake is devine! my partner would love your dishes, she likes these types of food! by the way, do you have a twitter account?